The Coolfire IV 40 watt box mod. With it being less than four inches tall and having a prebuilt 2000mah battery, the Coolfire IV makes a classically beautiful and highly functional companion when paired with sub ohm atomizers. 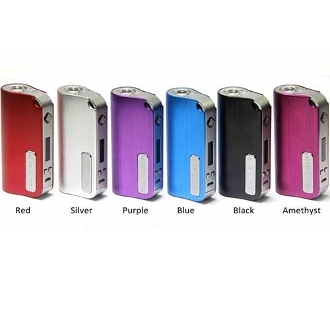 This box mod has both variable voltage and variable wattage settings, allowing for the Vaper to have a more personal and pleasurable experience. The wattage is adjusted by .5 increments giving you a range from 6.0 - 40.0 watts, while the voltage ranges from 3.0 - 7.5 volts and is adjusted by .1 increments. These ranges allow for the box mod to be equipped to handle clearomizers and atomizers that have an ohm of at least .2 and as high as 3.1. Keeping with their standard packaging, Innokin provides you with an ego to 510 threaded adapter, allowing you to attach it with cone threaded clearomizers. Along with the adapter, the Coolfire IV comes with one usb cable used for charging your mod, even while vaping. No charger? No problem! You will be able to prepare when and where your next charging will be needed thanks to the battery life indictor located on the Coolfire IV's OLED screen and on its LED lights located around the fire button. The LED lights will show one of three colors: Green, Yellow, and Red. The colors each represent your percentage of battery life; Green-fully charged, Yellow-you're halfway through, Red-low power/you should find a charger soon. To start the usage of your new Coolfire IV you must first turn the entire device on. Flip your box mod upside down so that its bottom is now facing you. Simply slide the power switch from off, to on. After the power switch is set to on, press the fire button (located above your display screen) 3 times to activate your OLED display. The Coolfire IV 40 watt box mod has several innovative features that will enhance your vape and insure a smooth experience with just a push of a button (literally). Now depending on your preferred vaping style, you can choose between using voltage or wattage as your setting. To switch from Volts to Watts, hold the fire button and the plus sign button at the same time. And to change from Watts to Volts, hold the fire button and the minus sign button simultaneously as well. To take a peek at your puff counter, hold down the plus and minus sign buttons at the same time and see how many times you've hit your fire button. Be aware that if the buttons are held together for longer than five seconds, you will activate the screen flip feature. To reset your puff counter press the fire button 3 times to deactivate your device and then slide your power button to off. The Coolfire IV box mod was designed with other features specifically meant for safer vaping. It has a 15 second cut off to prevent continuous accidental firing, a low Voltage warning, short circuit/atomizer protection, and a "Check Atomizer" warning. Oh! And we forgot to mention the most important feature of the Coolfire IV! Take the plastic case your box mod came in, lift up the black Styrofoam protection piece and grab your free stickers from Innokin! Dazzle your friends and fellow vapors with the Coolfire IV's eye catching elegant appearance and its charmingly convenient design. Feel the vaping power of high end technology, with just three little buttons at your fingertips.